Celebrity Infinity is a proud member of the Celebrity Millennium Class and sails to exciting destinations such as South America, Antarctica and Alaska. 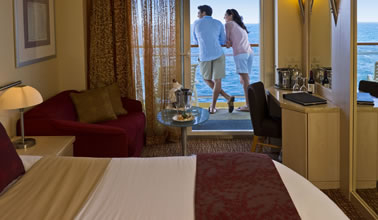 With plenty to offer in the form of action packed itineraries and luxurious amenities aboard, Celebrity Infinity cruises create an extraordinary and unforgettable experience. 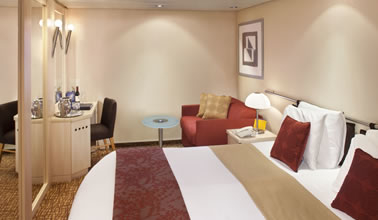 Aboard Celebrity Infinity, staterooms are stylishly fitted with forward-thinking design in every aspect. 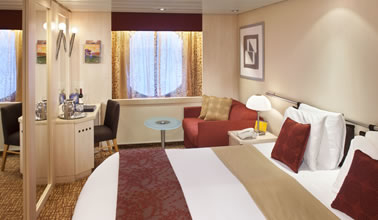 Indulge in extravagance from the moment you step on board. Reflecting the rest of the interior seen on its sister ships in the Celebrity Millennium Class, guests are made to sense that extra value from every aspect of their experience. Every detail has been considered, allowing guests to feel and experience luxury on a personal level. 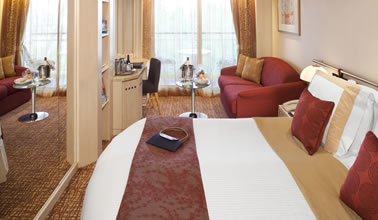 Aboard Celebrity Infinity, a stateroom is more than just a stateroom - it’s your own personal place of luxury where you can unwind and experience the very best in your own comforts. 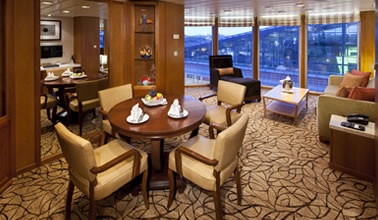 Celebrity Infinity has plenty to offer for both the adventure seeker and those looking to unwind and treat themselves. Enjoy exciting excursions by day or simply kick back and unwind by the pool, pampering yourself in the AquaSpa. Fancy something educational? Then why not stop by Celebrity Infinity’s iLounge and get a hands-on experience with the latest Apple products. Evening entertainment – Celebrity Infinity style! As evening falls, guests can indulge in the wide array of dining options and experience fine cuisine like never before. The Celebrity Infinity cruise ship caters to extraordinary tastes and the forward-thinking interactive menus, as seen at the popular Qsine restaurant, need to be seen to be believed. As the evening draws to a close, visit the Martini bar and sail away with the night – creating memories that you’ll remember for a lifetime.